Brinley Davies and his son Carwyn at Penlan Farm are our prime pig producers and ensure they have a weekly supply of both baconers and porkers available for us. Their herd is primarily of the Welsh breed. Carwyn is the third generation to be producing pigs at Penlan and Brinley and Carwyn together have a wealth of knowledge and experience gained over decades of producing baconers and porkers. They have supplied us on a regular weekly basis for some 20 years and have moved with these challenging times in the industry to meet the demands of a constantly changing market and are able to provide us with a constant and regular supply of quality product. 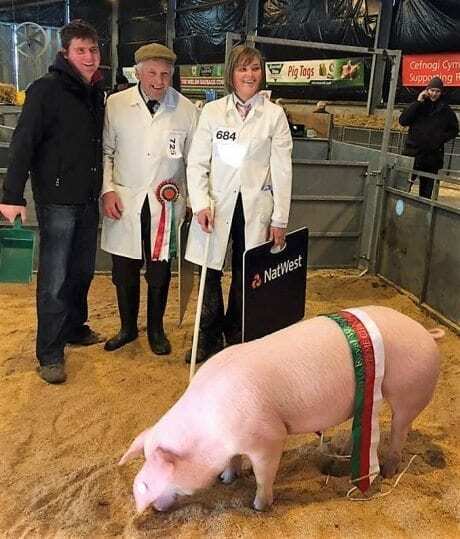 So proud to see them take the Single Pig Championship at the 2016 Royal Welsh Winter Fair with a pure-bred Welsh baconer…. and that on their first ever time of showing at Builth Wells! Well done! Keep us your good work.